As you probably know technology has really changed the way we select golf clubs. I know of many golfers who play regularly, who have simply walked into a shop and bought a set of clubs off the rack without being fitted. This seems mad to me. Golf is a difficult sport anyway, why not give yourself the best chance of playing well? As I already know the advantages to getting fitted properly, I thought I would take a trip to one of my local golf stores to have a chat and do a fitting to show you how it works and see if I could learn something new. I contacted House Of Golf (Epping) where I spoke to a Matt, a great salesman who was more than happy to oblige in helping with the process. I must admit, the thought of getting a full fitting scared me a bit. Will I be hitting it well? Will the results I see reflect what I see on the course? How much will it really help my game? So, let’s find out what it’s all about. The first thing that struck me was the personal nature of the fitting. It started with a lot of questions about me and my game. In particular what I was trying to achieve. This gave Matt a good idea of my attitude and the direction I wanted to take my game. I was quite clearly looking for a ‘players’ club that offered some help. Their range is very extensive so narrowing the choices down quickly is a really good thing. A quick measure of my height and arm length established the correct length of shaft I should be playing. He then went on to look at my swing and assess the type of club that would suit me. I was given quite a few practice swings to warm up and when I felt like I was swinging okay he gave me a club with a funny looking blue box on it. This would measure the swing speed, tempo and flex in the shaft. As I have covered before, the shaft can have a real impact on the flight of the ball. I personally feel that this is the most important factor for your new set. After measuring a few swings he entered the results into the computer program and found my ideal shaft options. This process also gave Matt a chance to see my swing and think about head options to match all the things we had discussed. The computer also gave its suggestion and that is where we started. After hitting a few models that we thought would be the best options, we made a decision on the head. The next thing to see was the lie angle. He placed a white strip on the bottom of the club. I proceeded to hit a few shots off a hard plate. This measures the lie of the club at the point which I strike the ball. Clubs can be adjusted ‘flat’ or ‘upright’ to match the players swing. Matt then went on to measure my grip size. He stated that too many golfers don’t even consider this as a factor. After hitting a heap of balls with the chosen club the computer analysed my distances, spin rates and smash factor. The computer program then suggested full club options from 3 iron to wedges. Giving us some choices of the wedge gapping. 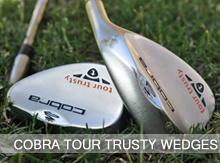 I chose my wedges on a distance factor rather then a loft factor. This would involve ordering my wedges to be custom bent to the angles that suit my swing. These clubs can then be equally spaced leaving me no awkward distance gaps in my set. After all of that the irons and wedges were decided upon and I thought we were done. Wrong. Matt was very keen to look at putters. He says that custom fitting a putter is really important. As we all know almost half of our shots are on the green so getting the right putter is vitally important. Now, I must admit, I have never considered this before. I’ve always just used one straight off the rack. We went over and had some further discussion about my putting and chose a few models that I preferred. We used a board to see where my eyes were lining up and the data told us that some putters would be a better option than others. Next we went back to the launch monitor and Matt fitted me up for a driver. This was relatively straight forward because we already had so much information about my swing and because the adjustable nature of drivers makes them very accommodating. Matt selected a few drivers and we adjusted them to match my swing to get the optimal launch angle and spin rates. After hitting a few, I decided on the driver that felt, sounded and performed to my liking. Matt was leaving nothing to chance. We then discussed the importance of balls and which models might suit my game and preferences. All in all, Matt was very thorough. What I really liked about this fitting is the time he took to understand me and my game – not just look at the computer generated numbers and make recommendations based on them alone. He showed a genuine interest in me and helping to find the clubs that will improve my performance. 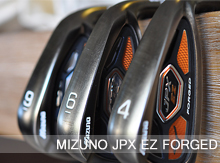 Based on my experience, I would recommend any golfer get a custom fitting when buying a new set of clubs. I found it insightful and interesting. 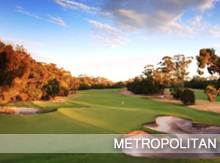 Of course, if you’re local to Melbourne, then be sure to visit Matt at House of Golf (Epping). This is Matt. Go and see him for a fitting on your next new set of clubs. 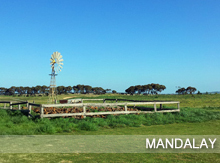 Mandalay is one of the newest courses on offer for Melbourne golfers. It’s a par 72 Peter Thomson designed championship course and is located in Beverage approximately 45 minutes from the CBD. This is a traditional estate course with housing surrounding many of the holes. 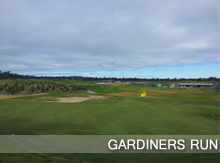 The course is very wide spread with a distance between each tee and green. It is set in a grassland environment with lush rolling hills forming the backdrop. 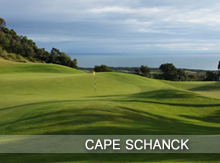 The course also rolls with undulating fairways and many elevated tees. You can usually clearly see where to go with the exception of a few holes which cleverly bend and dip or rise. The condition of the course is amazing. Quite notably the greens were in fantastic condition and rolled very true and smooth. The tees and fairways were also in great condition with a lush cover and well manicured turf. 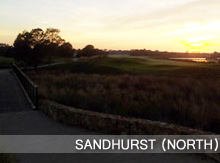 One of the features of this course would have to be the bunkering. There are quite a few well placed bunkers, but many can be easily avoided by selecting appropriate clubs or shots. As mentioned above, this course emerges from the surrounding grassland. The fairways are generous which is good because the rough is, well, rough! I also know that this particular area is a wind tunnel and you will almost always have some wind to contend with. When I played the wind was moderate but by no means strong. Still, I found that the ball was being pushed quite a long way. I think this course has an interesting and challenging layout. 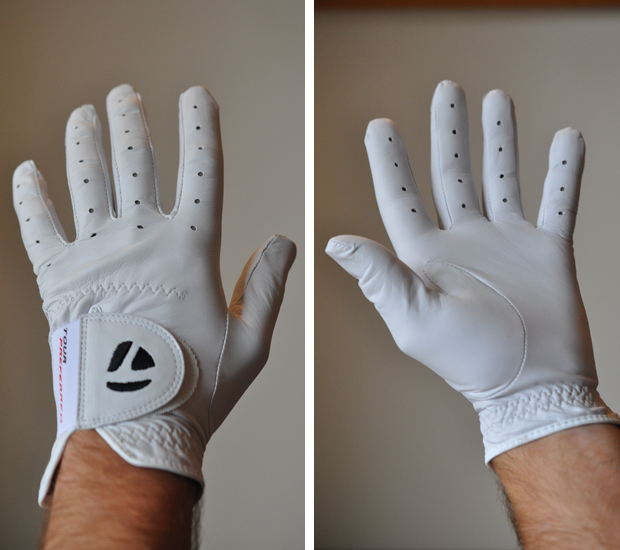 It will test even the best of golfers. I was playing okay and made plenty of pars with a few good opportunities for birdies. When I was in the fairway, the holes seemed quite straight-forward with good sized greens to hit. However, and it is a big however, roll even the slightest into the rough and the ball is most likely lost. I lost four out of five balls hit into the rough. I lost one ball that landed only slightly long of a green, took a bounce and…gone! This also happened to my playing partner as well. With the amount of wind, distance control was difficult and the consequences were huge for even the smallest misjudgement. Personally I’d like to see the rough a little more forgiving. I’m not saying mow it to the ground. If I miss a fairway, I do deserve to be penalised. But a lost ball every time is just soul destroying and can ruin a good round very quickly. 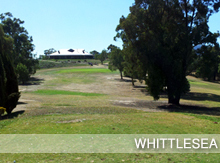 All in all, this is an excellent golf course in fantastic condition. 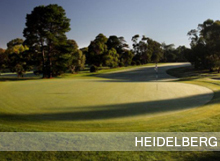 The layout is varied and interesting with many challenging holes that will not let you relax till the very end. I’d definitely recommend coming to Mandalay Golf Course for a game if you want to try out your skills against a championship course. Here are some of my favourite holes. The 3rd: A 182 meter par 3. You tee off from an elevated tee to a large green that sits horizontal to you. Distance control is the key here. Long will be better than short as there is a large mound at the back and a deep bunker at the front. Putting should be fairly straight forward once on the green. The 15th: A 202 meter par 3. A very long par 3 guarded by a dam short (really wont come into play unless you really hit a bad one). Bunkers short and long with a lay-up area left. Shoot for the green and hope for the best! The18th: A 391 meter par 4. A fantastic finishing hole. Long with well placed fairway bunkers and a guarded but generous green. Shoot for the centre of the fairway and play a long to mid iron into the green. Will really change depending on the wind. A tricky putt if you finish above the hole here. On an extra note. I must say that I really enjoyed the back nine. It had many great par 4’s that weaved through the fields to a scenic hilly backdrop (may change as housing continues?). I’m sure that most golfers would have had this problem at some point. 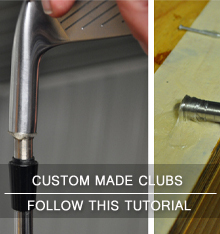 You look at your club and the ferrule has come up or lose. The first things that slip into your mind are; is the head coming off? Is the shaft breaking? Or maybe just – my beautiful clubs don’t look as good as they could. Don’t worry. This is a fairly common problem and one that is easy to fix. 1) Put the head between your feet and try to twist the shaft. Is there a clicking sound? Does the shaft move? If so, stop using it and re-set the shaft (I will be covering this soon). 2) Check the length has not changed by placing the club next to the clubs either side of the club. For example, if it is your 8 iron, stand it next to your 7 and 9. Look at the length of the clubs. Does the size graduation look right? Does it fit between them evenly? If not, the head may be coming off. You can see here that the lengths are equal and even. Pictured is my 6 iron to Pitching Wedge. These are not fail safe tests, however, it is most likely that it’s just the ferrule coming lose. Now, let’s fix that. 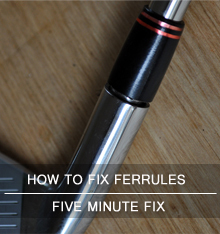 Use the hair dryer to gently heat the ferrule in order to break the glue bond. Yes, it did pay off buying the missus a good hair dryer for her birthday! Slowly does it here, you don’t need too much heat. Just enough to loosen the ferrule so heat and try, heat and try. You may not even need any heat. I moved one of my ferrules back into place without any heat (this is where you would use glue to re-set it – see below). Mix up the epoxy and using a toothpick carefully place the glue around the bottom of the ferrule (between it and the club head). Slide the ferrule back into place and clean up any excess glue with acetone. 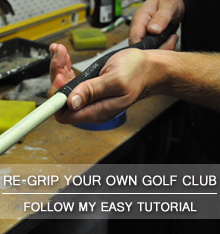 Use your grip cloth or rubber glove to twist and push the ferrule back into place. This can take quite a bit of force. Get a good grip and go! You’re done. 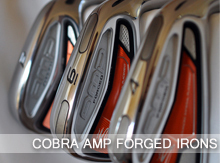 Hit the course with your awesome looking clubs. Golf is an awesome sport for any age. Being a teacher I see many of my students (and parents) looking for things to do over the school holidays. When a good buddy of mine said he was running a Junior clinic, I was all to happy to help promote his upcoming event. If you know a child who is still looking for a sport to play or just to try something new. Give Daniel a call. After all the future of our sport is the children who fall in live with this game. It’s funny how often I feel like I just don’t play to my potential. How often I seem to crumble under pressure or never really get going after a bad start. Does this sound like you? As I was playing the other week, partnered up with a new group, I got talking to one of the players. He was telling me about how he had changed his mental approach to the game. He said he’d taken his game down a few strokes by simply focussing on the things that matter. He credited this new found focus to a book. Now don’t get me wrong, I’m not that cynical and am a huge believer in the mental aspect of the game and how it can help or hinder you, though how powerful could a book really be? He was convinced it could help me. So one week later, what do I think? This book was quite a revelation. A revelation of common sense and things that I really deep down understood and knew. So, probably not that much of a revelation after all! However, it is written in a way that really speaks to me and provides a validating clarity for some of the things I often question. The way he describes the approaches to the mental game and the stories he tells about his work with tour pros are insightful and very helpful. Bob Rotella understands that “Winners learn to accept the swing they bring to the course on any given day and score with it”. This is one of my problems. “Without realizing it, they’re (me, and probably many golfers) doing everything possible to undermine their own game”. Some of the quotes that tell me I’m doing damage to my game were spelt out clearly in this book. Things like; “A little doubt or a little indecision is sufficient to impair performance”, “Dwelling on mechanics or trying to correct a swing flaw in the middle of a round (is hurtful)” or “The important thing is to adjust (to your swing for the day). 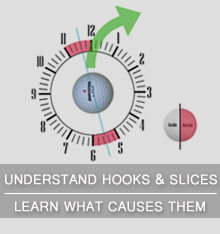 Too many players get obsessed with straightening out a hook or a slice that they could simply play with. Without realising it, they change their goal from shooting their best score to fixing their swing.” These are all things I am guilty of! Of course as golfers we know these things can be very hard to do. Dr. Rotella states, “A golfer chokes when he lets anger, doubt, fear or some other extraneous factor distract him before a shot”. This book tries to teach you about how important the mental game is and how you can work on becoming a mentally stronger golfer. He also understands that golf is about mechanics and that without sound mechanics you’re still going to have a high handicap. He gives meaningful tips about practise and how to maximise this time working on both mechanics and the mental game. For me, this book answers a lot of questions about why I can shoot par on the front nine and then 7 or 8 over on the back, or vice versa. I can feel my mental game drifting. Sometimes, I just can not seem to get back in that place where I’m scoring well. This book tells me that it is something I need to work on. To sustain that focus and be able to stay “loose and trusting” throughout a round requires commitment and focus. My mental game needs training just like my swing. If this sounds like you, I would definitely recommend this book. An easy read with realistic and helpful advice. You just have to be ready to hear it like I was. “In the end, you will realise that you love golf because of what it teaches you about yourself”. Dr. Bob Rotella got that spot on. Because what I learn on the course definitely helps me off the course too. Do you have a book that helped your game? 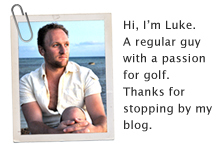 Golf Blog Australia would love to hear. Feel free to leave a comment.